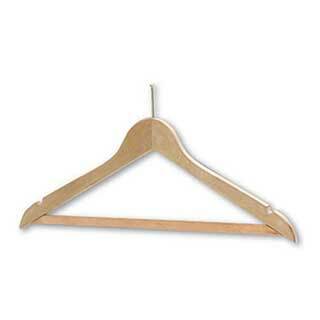 We have a wide range of coat hangers to cater for all kinds of establishments. Our range of anti-theft security stem or standard hooked coat hangers can be supplied with either chrome or brass metalwork. 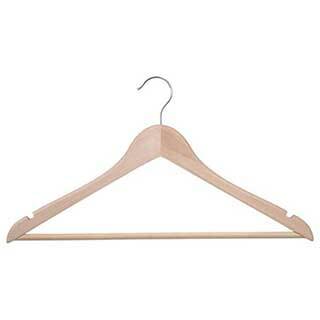 The metal hook, alongside the durable construction of the hangers makes them tough, robust and long lasting. 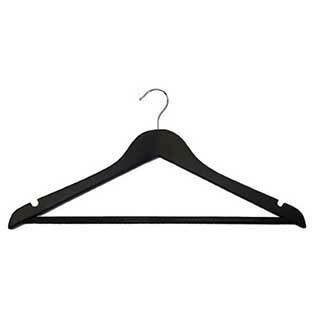 Our strong durable plastic hanger with either standard hook or anti-theft security stem has a stylish contoured shape for suits, jackets and shirts, and is supplied with underhooks for skirts and a non-slip trouser bar. 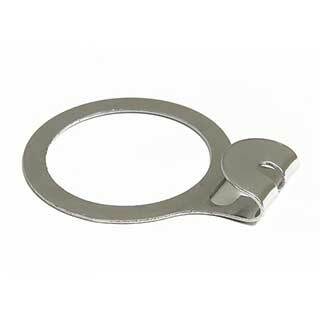 Security rings are supplied in chrome, brass and plastic. Hotel wooden coat hanger in natural beech with chrome security stem. Luxurious “wishbone” construction. Security stem in chrome metalwork. Contoured shoulders with skirt notches and trouser bar. Anti-slip rubber insert on wooden trouser rail. Suitable for trousers or skirts. Approximate dimension: 435mm wide. 50 coathangers per case. Security rings not included. 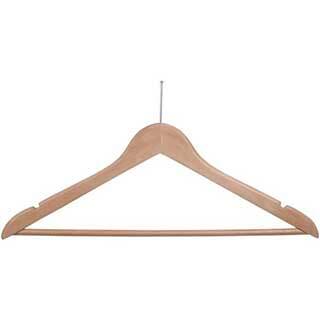 Hotel wooden coat hanger in natural beech with chrome standard hook. Luxurious “wishbone” construction. Hook in chrome metalwork. Approximate dimension: 435mm wide. 50 coathangers per case. 50 coat hangers per case. Contoured shoulders with skirt notches and non-slip trouser bar. 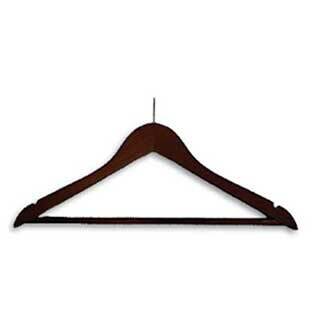 Classic hotel wooden coat hanger with trouser bar and standard hook. Hard wearing high quality solid beech wood. Jacket contoured shoulders with trouser bar with anti-slip insert. Made from hard wearing and modern beech wood. Metal hook. Large shoulder end. 40 per case. Plastic snap-on security rings for security stem hotel coat hanger. Easy for guests to use. Can be fitted without removing wardrobe hanging rail. 50 plastic rings per case. Internal measurement of ring is 35mm Available in cream only. Manufacturers 4 year guarantee. Brass security rings for security stem hotel coat hangers. Easy for guests to use. Non-opening rings for removable rails. 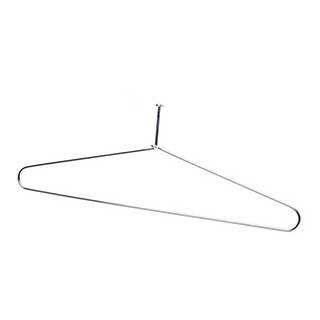 Fit a wide range of coathangers. 50 brass rings per case. Internal measurement of ring is 35mm diameter. Chrome security rings for security stem hotel coat hangers. Easy for guests to use. 50 chrome rings per case. Internal measurement of ring is 35mm diameter. 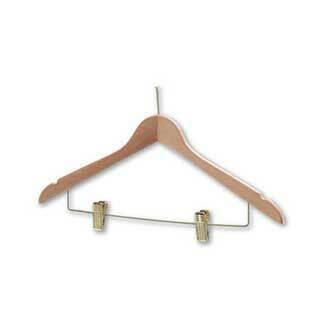 Deluxe hotel wooden coat hanger with skirt notches, metal trouser bar, metal skirt clips and security stem. Made from hard wearing and attractive beech wood. A solid sturdy and reliable hotel amenity. Sold in Case of 40 coat hangers. Deluxe hotel wooden coat hanger with skirt notches, metal trouser bar, metal skirt clips and standard hook. Made from hard wearing and attractive beech wood. 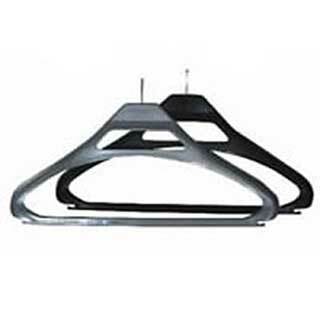 Hotel plastic coat hanger in moulded black plastic with security stem in chrome metalwork. 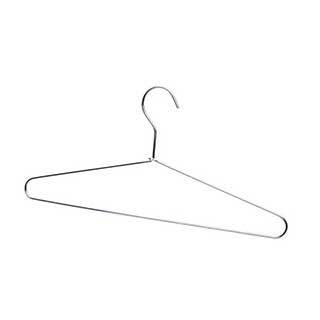 This strong durable plastic hanger has a stylish contoured shape for suits, jackets and shirts. 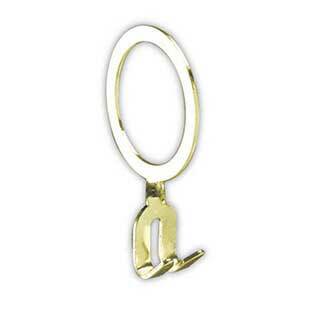 Supplied with underhooks for skirts and a non-slip trouser bar. 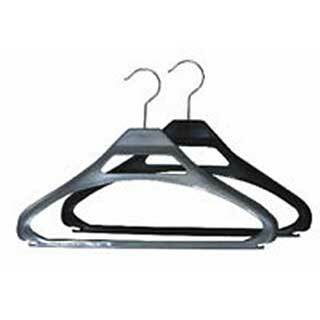 Robust and durable black smooth plastic hangers. Sold in case quantity of 50 only. 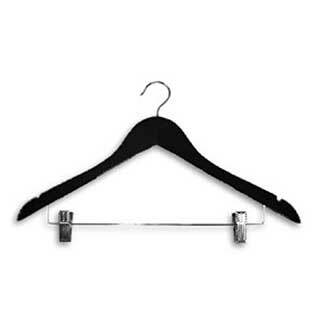 Hotel plastic coat hanger in moulded black plastic with standard hook in chrome metalwork. Robust and durable black smooth plastic hangers. Sold in case quantity of 50 only. 61p each. Classic hotel wooden coat hanger with trouser bar and security stem. Hard wearing high quality solid beech wood. Made from hard wearing and modern beech wood. Metal security stem. Large shoulder end. 40 per case. 40 coat hangers per case. Approximate dimensions; 435mm wide. Sold in pack of 50 only. 5 years manufacturers guarantee. Security rings not included. Approximate dimensions; 435mm wide. Sold in pack of 50 only. 5 years manufacturers guarantee. 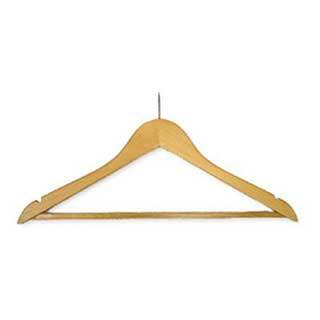 Hotel wooden coat hanger in natural beech with brass security stem. Luxurious “wishbone” construction. Security stem in brass metalwork. Approximate dimension: 435mm wide. 50 coathangers per case. Security rings not included. 5 year manufacturers guarantee. 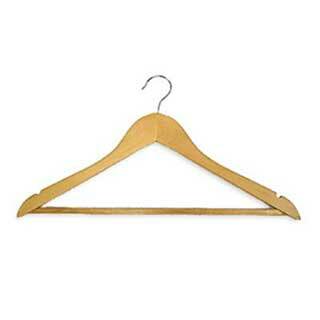 Hotel wooden coat hanger in natural beech with brass standard hook. Luxurious “wishbone” construction. Standard hook in brass metalwork. Approximate dimension: 435mm wide. 50 coathangers per case. 5 year manufacturers guarantee. Hotel wooden coat hanger in Mahogany with chrome security stem. Luxurious “wishbone” construction. Security stem in chrome metalwork. Contoured shoulders with skirt notches and non-slip trouser bar. Suitable for trousers or skirts. Approximate dimension: 435mm wide. 50 coat hangers per case. Security rings not included. 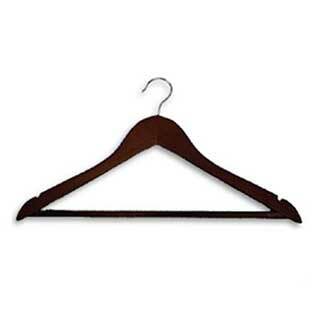 Hotel wooden coat hanger in Mahogany with chrome standard hook. Luxurious “wishbone” construction. Standard hook in chrome metalwork. Approximate dimension: 435mm wide. 50 coat hangers per case. Hotel wooden coat hanger in Mahogany with chrome security stem and chrome skirt clips. Luxurious “wishbone” construction. Security stem and skirt clips in chrome metalwork. Contoured shoulders with skirt notches and metal trouser bar. Suitable for trousers or skirts. Hotel wooden coat hanger in Mahogany with chrome standard hook and chrome skirt clips. Luxurious “wishbone” construction. Standard hook and skirt clips in chrome metalwork. 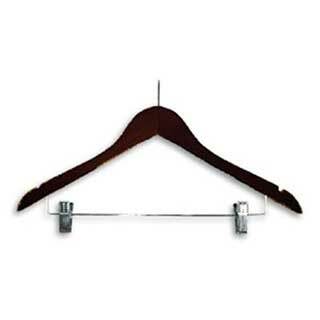 Hotel wooden coat hanger in black wood with chrome standard hook. Luxurious “wishbone” construction. Standard hook in chrome metalwork. A stylish looking heavy duty anti theft coat hanger, manufactured from 3.4mm diameter chromed steel. Anti-theft chrome hangers which are ideal for heavy duty use. Ideal for use in hotels, offices or high profile front of house areas. Dimensions:- 410mm (w) x 185mm (h) x x 3.4mm (d). Metal security rings are purchased separately. Care and maintenance: Clean with a dry, non-abrasive cloth. Do not use abrasives or solvents. 1 year manufactuers guarantee. 50 chrome rings per case. Internal measurement of ring is 38mm diameter. Care & Maintenance:- Clean with a dry, non-abrasive cloth. DO NOT use abrasives or solvents. A stylish looking heavy duty standard hook coat hanger, manufactured from 3.4mm diameter chromed steel. 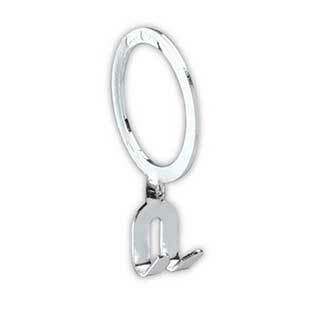 Standard hook chrome hangers which are ideal for heavy duty use. Dimensions:- 410mm (w) x 185mm (h) x x 3.4mm (d). Hook adds 80mm to height. Hotel wooden coat hanger in Black Wood with chrome standard hook and chrome skirt clips. Luxurious “wishbone” construction. Standard hook and skirt clips in chrome metalwork. 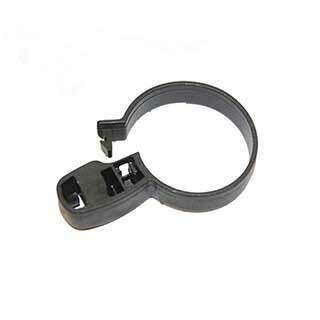 Black plastic snap-on security rings for security stem hotel coat hanger. Easy for guests to use. 50 plastic rings per case. Internal measurement of ring is 35mm Available in black only.